Creating keepsakes for loved ones is such a joy for those who love to sew. With her simple blankets, Sue Kerlin shows us how she continues her love of giving to family even when life is too full for intricate details. I picked this pattern of baby quilt because I am not a detail quilter. 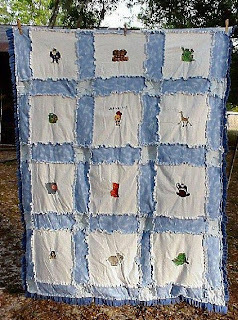 I was sent a picture of a quilt with "outside seams" and thought it looked easy enough. The effect it gives the quilt is inviting, warm, cozy and so soft, just perfect for a "northern winter" baby. I have sewn for years, but working full time and sewing, I have lost interest in real "detailed" items. In my book, this is a "simple" quilt. I used blue and white checkered flannel for the squares that I embroidered, and a blue cloud flannel for the strips between. The small squares are a solid light blue. The larger squares are 10 inches and the stripes between are 5 inch by 10 inch pieces. The small squares are 5X5. You can determine the size of blocks by what size you want your blanket. I embroidered the larger blocks, using mostly patterns I got from AnnTheGran web site. To assemble, I used a 5/8th inch seam toward the front of each piece. 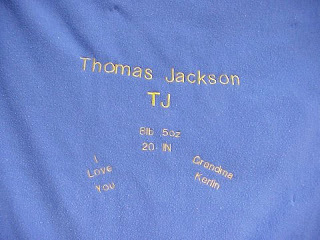 After it was completely put together, I attached it to a fleece back that I also embroidered with name, date of birth, weight, and length. I also sent my love and signed the blanket with embroidery. Each of the little blocks are also tied to the fleece with doubled yarn knots with one inch pieces left. This holds it really solid for washing. On the front reversed seams, I clipped them about every inch. Each time it is washed, it becomes fuzzier and softer. This was first made for my 3rd granddaughter, then for my first grandson. The granddaughter's theme was ducks, so I used them in the pieces between the embroidered blocks and ducks for some of the designs on the blocks. My grandson's theme was wild animals, so I changed the block size and did his a bit different and it was a little easier to do. It is so nice to have ultrasounds and know ahead of time what designs can be used. Notice the little boy with the side-ways hat is on both. That design fits the way their daddy looked when he was growing up, I am so glad we found it. I made different blankets for the first 2 granddaughters, but I liked the look of this so much that I made a full sized one out of denim and patterns that my 15 year old granddaughter could relate to for Christmas last year. 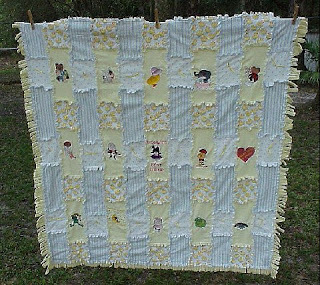 The blocks of it were denim with flannel cat fabric between since she was called "kitten" by her uncle when she was little. This is VERY simple. Centering the design in the middle is so easy, I folded it in quarters and chalked a dot for the middle. I then lined my embroidery hoop so the dot was in the center of it. Assembly is also easy. If you can sew a straight line, you can make the quilt, and I find it very relaxing to do. I have a Brother PE-150, a small embroidery machine. I never thought I would use it as much as I have, but find it fun and a nice way to personalize things. I work full time, but hide out and play often in my special room. I have no idea. Each block took at least an hour, but while they are stitching, I also did other things with my regular machine, so time flew by. It was fun watching the different designs progress. It was fun, not stressful at all and is a great keepsake for my grandbabies. They will always know I stitched it with love. The free patterns available at AnnTheGran.com are wonderful. If I would have had to pay for all of the designs I used, I simply could not have afforded to do it. Do you have any creations that go with a great story? If so, we'd love to hear about them, and see them! 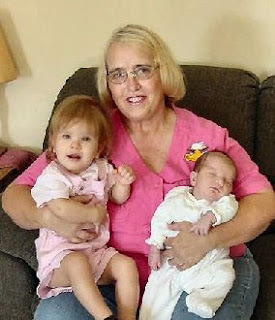 If we choose to post your project, you'll get a free $25 gift certificate to use in the AnnTheGran.com online store. Click here for details on how to submit your creation. Sue has found fun ways to keep on sewing even when life consists of a full time job and growing family. Click on the Comments link to tell us about your favorite stress free project or past-time. Christmas Tree Skirt from Table Runners A Little Treasure - Should I Or Shouldn't I?